Slayer have announced new North American dates for their Final World Tour. The fifth leg of the ongoing outing kicks off May 2 at the Ak-Chin Amphitheatre in Phoenix and wraps at the Xfinity Center Amphitheatre in Mansfield, MA on May 25. The band will be supported by Lamb of God, Amon Amarth and Cannibal Corpse on all dates. Details on Slayer VIP Packages are available here. 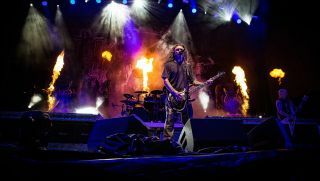 The band have also shared Episode 3 of the "Slayer Looks Back on 37 Years" video interview series. In the clip below, Tom Araya and Kerry King talk about getting their first record deal and the release of Show No Mercy; and Tom, Kerry and Paul Bostaph remember Paul's first meeting with the band and his subsequent audition to be Slayer's drummer. Check out the full 2019 North American itinerary below, and for more information, head over to slayer.net.